–Discounted cruises still sell excursions at regular prices. –Hotel specials still charge full rate for meals. –Resort deals still do not discount activities and sports. The way to obtain greater savings is with specials at all inclusive resorts like Ixtapan Spa Hotel and Golf Resort. A 10% discount on February and March packages covers 10% on every part of the vacation: meals, spa services, classes, golf/tennis lessons, am walks and fitness classes, not just on room rates. That means taxes and tips drop accordingly. Known for value with quality over its 60 years, Ixtapan Spa Hotel and Golf Resort was just voted one of the most affordable spa resorts in the world by readers of SpaFinders. Packages begin at $735 for a 4 night spa classic and $675 for a 4 night golf/spa classic. In US terms either is the cost of a 6 hour Day Spa Experience. But the 4 day package includes all meals, bottled water, 3 massages, 2 facials, 2 reflexology, 1 loofah, 1 fango, 1 hair treatment, 1 hair styling, 1 manicure, 1 pedicure, and multiple fitness classes. Added bonus: the Peso is 25% lower so regular people can afford to shop! During the first meeting, convened by the Mexican government, the President explained the main aspects of Mexico’s environmental policy for coping with and reducing the effects of this global phenomenon and underlined the need to continue working and increasing efforts to reduce environmental pollution, prevent the excessive exploitation of natural resources and encourage a culture of respect for the environment. For his part, Yvo de Boer, Executive Secretary of the United Nations Climate Change Framework Convention confirmed Mexico’s important as a hub in international negotiations. He also hailed Mexico’s commitment to halving carbon emissions by 2050, which he regarded as an example of long-term vision in environmental policy. Internationally-acknowledged specialists attending the meeting included: Al Gore, 2007 Nobel Peace Prize and former US Vice-President; Mario Molina, Nobel Chemistry Laureate 1995; Fred Krupp, President of the Environmental Defense Fund; Professor Jacques Markovitch, ex Environmental President of the World Economic Forum, and Nicholas Stern, author of The Stern Report on the economics of climate change. 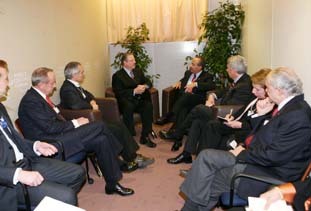 During the meeting, the Mexican president exchanged views with the Prime Ministers of Korea and Sweden, as well as top-level representatives of the Ministries of the Environment and Energy, international and private sector organizations, on aspects involving the mitigation, adaptation, technology transfer and financing that will help effectively combat the phenomenon of climate change. Acting as reporters on the meeting were Tony Blair, UN Representative for the Environment, Kofi Annan, UN General Secretary for the period from 1997-2006 and Al Gore.